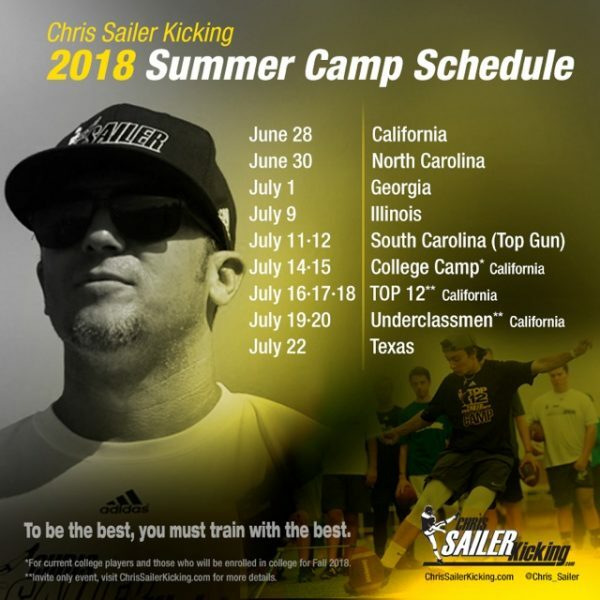 *Noah and Ryan will receive FREE Chris Sailer Kicking Camps for 1 Full Year! Class of 2020: Daniel Cristiani (IN), Holt Cloninger (NC), Fabien Guillen (CA), Race Mahlum (CA), Hunter Renner (IN). Class of 2019: Charles Bein (CA), Jack Bosman (CA), Hunter Benton (SC), Ryan Fitzgerald (GA), Cade Fuller (CA), Noah Grant (OH), Ben Kiernan (NC), Austin McNamara (AZ), Jack Oswald (CA), Nolan Parris (NC), Ryan Sanborn (CA), Gavin Wale (NV), Joey Mitchell (OH), Alan Kervin (FL), Jacob Barnes (LA), Nathan Batten (TX), Cayden Camper (CO), Brandon Dickerson (SC), Will Ferrin (UT), Tom Foley (IL), Ben Freehill (IL), Jackson Garcia (AZ), Charlie Mendes (CA), Patrick Nations (SC), Michael O’Shaughnessy (OH), Matthew Rigney (TN), Aaron Rodriguez (CA), Justin Seay (OK), Colton Theaker (CA), Gabriel Whipple (MO). Junior College / Transfers: Jaime Medina (CA), Carson Olivas (CA), Andrew Rodriguez (CA), Corey Lewis (CA), Prominence Akubuo-Onwuemeka (CA), Tanner Carcamo (CA), Julien Mayeur (CA), Jared Porter (CA), Ricardo Quintero (CA). 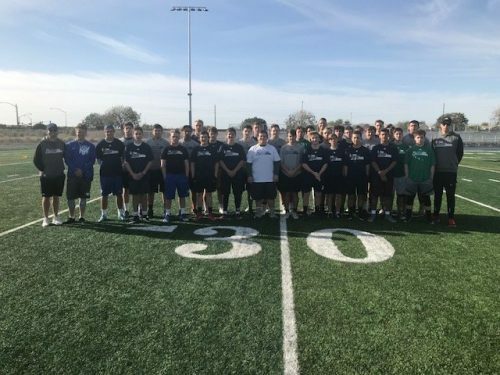 2018 AZ Spring Camp Recap, Janikowski Wins It! The Road to Vegas XXXII continued with a stop in Phoenix, AZ on Sunday March 25th. This camp continues to grow and bring in more talent each time we visit. There was a great balance of young specialists and older veterans looking to learn and make a name for themselves. The competitions were tight and extremely competitive. Take a look at the results. 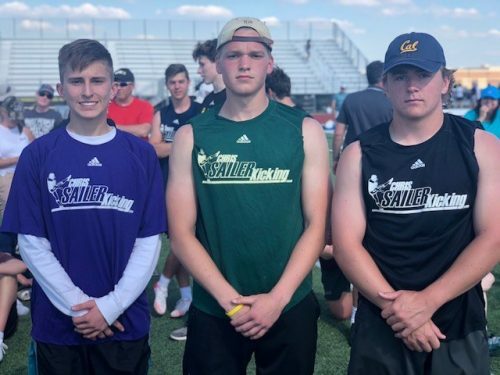 The longtime Chris Sailer Kicking Kicker had one of his most impressive performances to date. He won the kickoff competition by averaging 65+ yards with 3.8 – 4.05 hang time. His best ball measured 77 yards with a slight wind. Dean was also a finalist in both major field goal competitions. In the end he nailed a pressure kick to win it all. He continues to prove that he is a D1 recruit. Jason came out on top of both major field goal competitions. 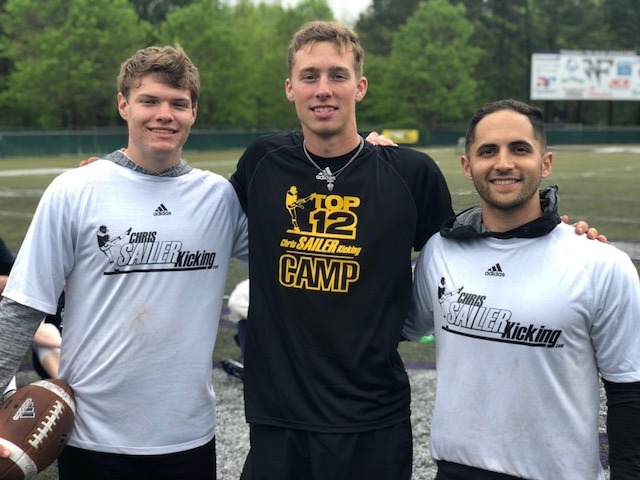 Another long time Chris Sailer Kicking Kicker is beginning to really come into his one. He is one of the more consistent performers in the country and his strength is improving each time we see him. Jason has all the tools to take his game to the next level. Look for him to impress college coaches around the nation this summer. The TOP 12’er and long time Chris Sailer Kicking Punter dominated the field once again in the punting competition. He averages 45+ yards with 4.6+ hang time. He is also a very consistent performer. Austin currently holds a scholarship offer from the University of Arizona and should add multiple offers from major schools this spring and summer. He is D1 Scholarship Pick without a doubt. 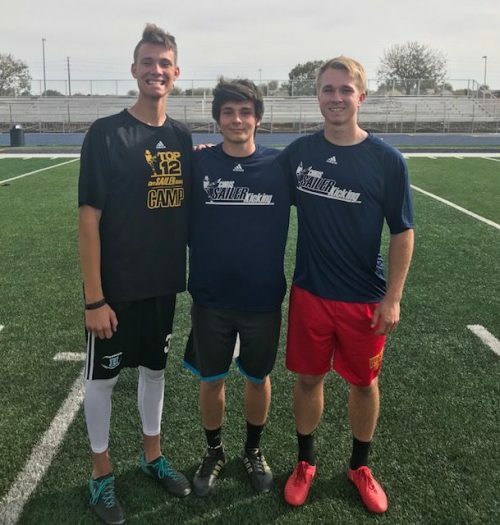 2018 CA Spring Camp Recap – Seth Vernon Wins It! The road to Vegas XXXII has officially begun. 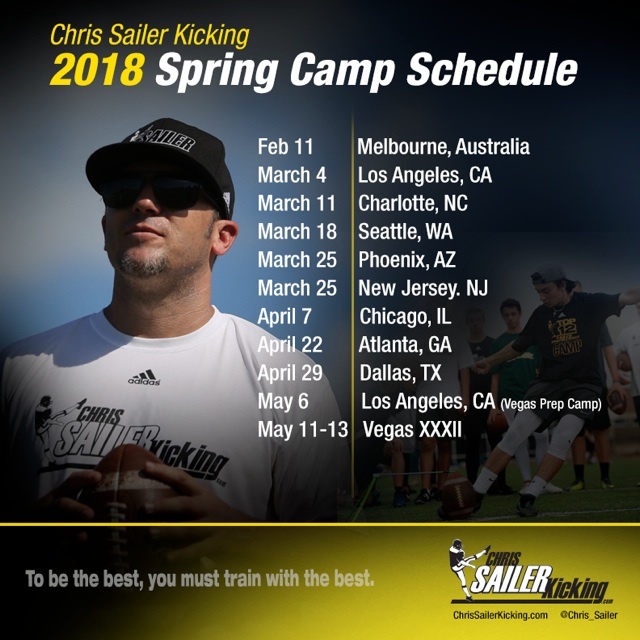 The 2018 Chris Sailer Kicking Spring Camp Tour started in Los Angeles, CA on March 4. Well over 100 specialists representing over 10 states were in attendance at Notre Dame High School. The talent was off the charts. This camp was a great indication of how fierce the competition to make TOP 12 in Las Vegas is going to be in May. Take a look at the results. Seth Vernon (JC, CA) – Seth is an incredibly talented athlete. The 6’5”, 215 pound punter showed incredible potential from start to finish. He shows the ability to hit a big time D1 punt and became more and more consistent as the day went along. He won the camp by nailing 9 of out of 10 punts 40+ yards with 4.4 plus hang time in the finals round. He hit several balls 50+ yards with 5.0 plus hang time. Seth should be the #1 junior college punting prospect in the nation in the Class of 2019. Ronan Donnelly (2020, CA) – Ronan had an outstanding all around day. He was smooth and accurate on field goals and got great height on his ball off the ground. He also showed that he can hit a D1 level kickoff. His best ball measured 68 yards with 4.08 hang time. Ronan has proven that he is a top national kicking prospect in the Class of 2020. Big things are ahead for this young athlete. 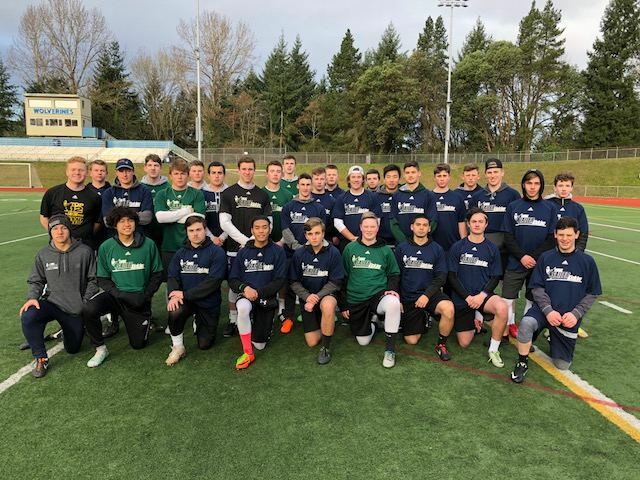 Harry Hill (2019, HI) – Harry was one of the very best kickers in attendance once again. He recently won a major field goal competition in Las Vegas and followed that up with another one in CA. He hits a pure ball and is one of the most consistent performers in the nation. Harry is also strong on kickoffs. Look for Harry to dominate Vegas XXXII in May and should challenge for a TOP 12 spot. Andrew Rodriguez (JC, CA) – The long time Chris Sailer Kicking Kicker/Punter was solid as usual. He won the kickoff competition by hitting 4 kickoffs 65+ yards with 3.8 – 4.1 hang time. He was also one of the best field goal kickers and did a nice job punting the ball. He is a top junior college prospect that is eligible to transfer now and still has 4 years to play 3. He is going to make a fine addition to any college football program.